With about five years of commuting with an Oakley Toolbox 2.0 backpack, the time had come to look for a replacement. While the Oakley backpack likely had another year or so of use left in it, the bag had gotten to the point where fabric was fraying, zippers were no longer working flawlessly and I was getting ready to move on. Plus, being a bag whore, I was bored of the bag. I've always preferred backpacks to messenger bags for commuting. 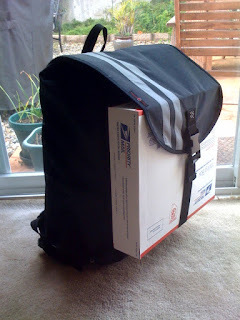 Sure, messenger bags are what most of the professional messengers (and hipster fashionistas) use, but for me they put undue strain on one shoulder, tend to shift around and most don't have the overall capacity that a backpack offers. After researching the various backpacks, I selected a Banjo Brothers Large Commuter Backpack back in the fall. Banjo Brothers is a small but growing bag company based out of cycling-mad Minneapolis. Not only do Banjo bags feature simple and timeless styling, but they're also very-well constructed. Standing about 20" tall, 12.5" wide and 8" deep, the first impression is that this is indeed a very large bag. Banjo touts the bag as being waterproof, and the design definitely seems to be so, with a durable ballistic nylon shell wrapping a heavy tarp-like liner that protects the contents from the elements with a fold-over top. But since I live and commute in San Diego county, I can count on one finger how many times this bag was out in even a moderate rain. I can report that the nylon is blood-proof though, as there are a few stains on the outer flap from my crash back in early February. 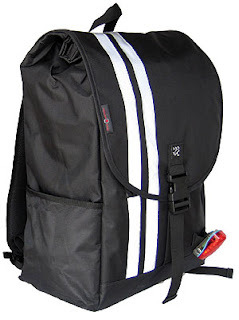 Other exterior features include a u-lock pocket, reflective stripes, a "blinky" light clip and wide padded straps with both a sternum strap as well as a waist strap. My initial impression was that the waist straps were too narrow to adequately distribute the forces, plus, being more of a beanpole body type (33" waist), the excess strap ends flapped about while riding. Small elastic bands would do wonders for strap management. However after the first few commutes I ended up un-clipping and removing the waist straps and haven't missed them. The bag stays in place and won't sway, no matter how large the load. And speaking of loads, I've had a number of rides where I utilized all 2000 cubic inches of capacity - and then some. 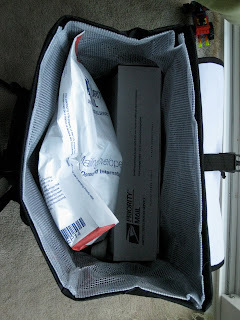 ...by strapping an additional box to the outside of the backpack. The strap was near its length limit, but the box remained solidly in place for the two mile ride. The back of the bag is minimally-padded, so it's best to pack the bag in a manner so that sharp edges won't protrude into the rider's back. I'll generally roll up my clothes for a comfortable and form-fitting shape. The last exterior feature to mention is the strap-mounted cell phone holder. Unfortunately this really only fits older-style phones. Smartphones won't fit. 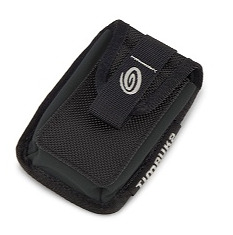 But it's easily removed, so I swapped out for a Timbuk2 2-way accessory which fits an iPhone perfectly. I'm told that Banjo Brothers is working on a new phone pouch to address this issue. Under the flap the bag has a one moderate-size zipper pouch that runs the width of the bag, a few pen holsters and one Velcro-topped pouch that I use for a CO2 cartridge and a mini tool. Inside you'll find no frills, just the previously-mentioned removable/replaceable inner liner. Secured with a few Velcro tabs at the mouth of the bag, the tough material is destined to last the life of the bag. However, if it does get damaged, it's very inexpensive to replace. One of the best features of the bag is how it has been designed to sit lower on the rider's back than most backpacks. While my old Oakley backpack would sometimes interfere with the back of my helmet, I've had no such instances in the five months that the Large Commuter Backpack has been in use. Banjo Brothers did an admirable job designing this bag. It's stout construction and thought-out details make it an easy choice, especially considering the reasonable price. I hope to get many years of use out of this. The Oakley commuter backpack shown in the post really look very trendy and beautiful one. It really look like hipster rucksack. One would definitively love to own one such a backpack for them in the life. Thanks a lot for sharing the post and expecting a lot similar one in the future.